Seaweed Salad | That Yum Factor! 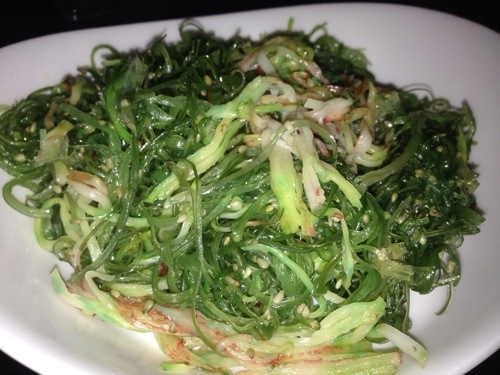 I never understood the concept or the hype around a “seaweed salad.” The name itself does not serve as good PR for the dish, BUT I am now hooked. I must admit I had to have it twice to be won over. My favorite is from Teak, because they serve it with cucumber, crab, and tempura flakes. If you have never tried seaweed salad, I’d recommend starting here. It’s got a distinct flavor to it with a crunchy cold texture, but try it twice and I think you’ll enjoy it. I will admit that it is an acquired taste. Even if you still aren’t the biggest fan, at least you tried something new? Someone also told me it’s extremely healthy for you, which doesn’t hurt now that summer is fast approaching – am I right all my fellow Squan-abees? Posted in Hudson County - NJ, Image format and tagged Hoboken on April 29, 2014 by thatyumfactor.